Georg Landsberg attended school at Breslau. He then studied at the Universities of Breslau and Leipzig between 1883 and 1889. His doctorate was awarded by the University of Breslau in 1890. 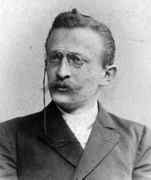 Landsberg joined the teaching staff at the University of Heidelberg in 1893 and he taught there being promoted to professor in 1897. In 1904 he returned to Breslau as extraordinary professor of mathematics but he was only there for two years accepting an offer of a post at the University of Kiel. At Kiel he was promoted to ordinary professor of mathematics in 1911 but sadly he was only to hold this post for a short while since he died the following year. Landsberg studied the theory of functions of two variables and also the theory of higher dimensional curves. In particular he studied the role of these curves in the calculus of variations and in mechanics. He worked with ideas related to those of Weierstrass, Riemann and Heinrich Weber on theta functions and Gaussian sums. His most important work, however was his contribution to the development of the theory of algebraic functions of a single variable. Here he studied the Riemann-Roch theorem. He was able to combine Riemann's function theoretic approach with the Italian geometric approach and with the Weierstrass arithmetical approach. His arithmetic setting of this result led eventually to the modern abstract theory of algebraic functions. One of his most important works was Theorie der algebraischen Funktionen einer Varaiblen Ⓣ (Leipzig, 1902) which he wrote jointly with Kurt Hensel. This work remained the standard text on the subject for many years.